There are many different Types & Styles of barns around. We hope information on our site will be of some use to you. We tried to cover as many Types & Styles of Barns as we possibly could, at least the ones that are most common and widely used. Yes, we do realize that there are plenty of other styles & types of barns that we do not list here. Styles that simply have different barn shape (round, octagon, hexagon, pentagon, you name it...), we are not going to cover here. 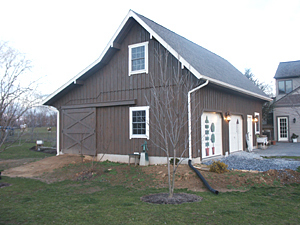 Timber frame barns & mortise and tenon barns are both described on Post & Beam Barns page, since they are both considered to be Post & Beam barns. Perhaps in future we'll add more types & styles of barns. Please consider contributing some of your barn images. If you have any images of Post & Beam Barns, Timber-Frame, Round Barns, Salt Box, Pole Barns, etc. and barn framing detail images, please let us know. We would like to display more barn images on our website to help our visitors better understand different barn construction techniques. There are many portable sheds available for consumer to purchase. These sheds may include regular storage sheds or specially made equine sheds. We should note that horse sheds are built sturdier than your typical garden shed. Construction specifications are shown to help you better understand how these sheds are built.